The healthy human aortic valve regulates flow from the left ventricle of the heart to the body during systole via full opening of the valve leaflets. During diastole, the valve leaflets close to eliminate or minimize blood flow backward through the valve into the left ventricle. Some patients suffer from dilation of the aortic valve annulus and aortic wall allowing blood to flow back into the ventricle resulting in AI. The HAART 300 ring design was developed from high-resolution CT angiographic studies of 10 normal human aortic valves. The design process is depicted below. All views are in the same orientation. Panel A: High resolution 1 mm thick axial slices of the entire valve were analyzed to assess the anatomy of sinus-leaflet complexes for the right coronary cusp (green), left coronary cusp (orange), and non-coronary cusp (yellow). The structure of each leaflet-sinus complex was defined by maximal numbers of points in Mathematica, and subcommissural areas were marked by red points. Panel B: After incorporating all vertical slices, the subcommissural and annular regions appeared as a 3-pointed coronet with highly elliptical base geometry and outwardly flaring subcommissural posts. Panel C: A representative study shows the elliptical valve base geometry and flaring posts, with a 5-8º outward flare (tops of all 3 commissures are shown as green circles). The flare was always similar for the 3 posts, and average circumferential lengths between commissures were statistically equivalent. The post of the non-coronary / left coronary commissure was always located at the posterior minor axis diameter – circumference intersection (also the center of the anterior mitral leaflet), with the right coronary cusp centered opposite. Panel D: The final design of HAART ring was based on the average geometry of the 10 normal human valves, with an elliptical 2:3 minor-major diameter base geometry and 10º outwardly flaring posts. 2:25 – In addition a HAART 200 Bicuspid ring has been developed for patients with congenital bicuspid valves, or valves where 2 of the 3 leaflets have fused and the valves demonstrate AI. A sizer designed specifically for use in bicuspid patients measures the leaflet free edge length of the larger leaflet or the two fused leaflets. The appropriately sized HAART 200 ring is implanted in the same procedure as described for the HAART 300 tricuspid device. For bicuspid leaflets that are not a 50/50 valve diameter split, additional leaflet surgical procedures are conducted to reconfigure the valve with two equally sized leaflets. Once the ring is in place and the appropriate leaflet alignment is established the valve once again is competent with no regurgitation. 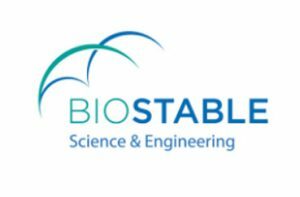 BioStable Science & Engineering, Inc. (BioStable-s-e) is developing innovative new products for the treatment of cardiovascular disease. BioStable is led by an experienced group of industry executives with expertise in rapid and effective medical device development.